Saturday, November 18 was the last community volunteer Day of 2017 at Stuyvesant Cove Park, and there couldn’t have been any better way to celebrate. A first in many years, the event was a partnership between Stuyvesant Town and Solar One — the rekindling of the collaboration between neighbors that will grow into next season. New York Cares, a strong partner of the park for quite some time, also joined for a healthy turnout of almost fifty people of all ages. As part of Stuyvesant Town’s Good Neighbors Program, residents and employees joined the event to volunteer, and the group included several kids. On Friday, June 13, after CWCapital forecloses on the mezzanine (junior) debt for Stuyvesant Town and Peter Cooper Village, there is a very real threat that Fortress, the parent company of CWCapital, could use a questionable contract clause to instantly become the owner of our two complexes. What happens on that day will affect us all. It could be Tishman Speyer redux. The financial press is speculating, full of scenarios providing detailed financial road maps to our demise. Fortress is seeking to bid $4.7 billion for a property valued at $3.2 billion. Possibly adding nearly 50 percent more debt to the property in ​yet another overleveraged buyout will lead to problems for every one of us. These problems will assuredly be worse than what we have faced since 2006. A show of our strength starts at 10 a.m. on June 13, when members of our community will assemble at City Hall to demonstrate our backing of the elected representatives who right now are working to try to save us from a predatory takeover. Let’s show Mayor de Blasio that we are a community worth saving, and show the hedge funds and real estate moguls that we are a community to be reckoned with. It’s worth making a serious effort to swell the group that will be bused to City Hall and back. The two core groups that make up our community must stay united. The New Stabilizers have held on, many by their fingernails, so they can convert their high rents into more affordable long-term equity as apartment owners. Members of this group are the most vulnerable to losing their homes via exorbitant rent increases. The point will come when large numbers of New Stabilizers will be driven from a community that has suited their needs. More instability for everyone. It’s heartbreaking that New Stabilizers will have to uproot their children from our fantastic local schools that I and others here got the opportunity to go to. These parents will have the painful task of explaining to their kids why they have to make new friends as they are forced to find another home. For this group, a takeover by anyone other than the tenants is their tipping point. The second group — long-term traditionally rent-stabilized tenants — has a target on their backs too. They’re not as easy to hit, but a predatory owner will try, using the same tactics so ferociously applied by Tishman Speyer to challenge the legality of tenants’ stabilized status. Demolition of buildings is also a possible — and perfectly lawful — means for eviction. Tearing down our aging structures and “developing” our green spaces with shiny new towers is one sure way to pay down the debt. For all of us, a tenant-led purchase is the only defense against a new predatory landlord. If you’re a long-term rent-stabilized tenant, you’ll be able to stay in your home and enjoy the same rent-stabilized protections you’ve always had with neighbors as your owners rather than hedge funds or dynastic New York real estate families. For all of us, a new predatory landlord means more bad leasing policies that expand the number of “converted” apartments, which create higher concentrations of roommates in dorm-like occupancy, accompanied by more of the inevitable noise and bad neighbor behavior. Churn, transients and predatory speculation are the problems. The answers are the young stabilizing families and responsible couples and singles vesting in their community and standing shoulder to shoulder with their longer-term neighbors who may wish to remain as renters living peacefully in their homes. We all share the desire for our children and our neighbors’ children to grow up in the same safe, unique, extraordinary city setting many longer-term tenants have had. We need to carry on that tradition. If ever there was a time to be vocal and visible, that time is now. If we just accept what might happen on June 13, we and our children will have to face the consequences. Don’t let Friday, June 13, be the final chapter. Join us and fill the steps of City Hall to show the world we are organized and that we are a community, not a commodity. For more information about the rally and to RSVP for transportation, visit http://stpcvta.org/june13 or call (866) 290-9036. I’d like to bring to the attention of our neighbors who were affected by Hurricane Sandy but who may still be questioning whether climate change is happening due to human continued use of fossil fuels like coal, oil and natural gas (methane) that the Sierra Club has some answers. Their monthly meetings take place in the Seafarers & International House located at 123 East 15th Street on the northeast corner of Irving Place on the third Wednesday of the month. On May 21, I attended the third in their sustainability series called “Photovoltaics.” To my surprise and delight the first speaker was Chris Neidl recently back from India and at work again with Solar One. Chris was followed by Marlene Brown from the New Mexico Department of Energy. Both speakers answered many questions from the packed audience about solar energy for New York City. Many of us remember how when Hurricane Sandy hit, the Solar One building in Stuyvesant Cove Park was the only place in our neighborhood that had electricity due to solar energy stored in its generator and people were coming to power their cell phones and medical apparatus. Solar One staff and volunteers brought solar panels and apparatus to the hard hit areas of the Rockaways and other coastal areas of NYC to help out. On Wednesday, June 11, Solar One will celebrate its 10th anniversary with a boat trip from the East 23rd Street pier at 6 p.m. followed by a picnic supper and dancing under a big tent at the Cove until 10 p.m. For more information and other events go to http://www.solar1.org. The last in the Sierra Club Spring series takes place on Wednesday, June 18 on President Obama’s climate action plan with the Judith Enck, Head of Region 2 EPA (NY, NJ and Puerto Rico) as the speaker. There have been many ideas suggested for how hard hit coastal areas like ours can be protected from future storms. This would be a good time to ask our questions and hopefully get some answers. Doors open at 6:30 p.m. for socializing and refreshments. Programs start at 7 p.m. $10 suggested donation; $3 for students. Who knows? Maybe it’s a dream, but perhaps sometime in the future Stuyvesant Town could become an Eco Village and resilient. We are all aware of the seeming increase in the frequency of attacks by persons who were later diagnosed as having a serious psychotic condition (e.g., schizophrenia, bipolar disorder, depression and…). In fact, the woman who tried to crash the gate of the White House was probably suffering from post partum depression. Most of the others we have heard about were suffering from schizophrenia – which about 2 percent of the population has or will get. When someone has a psychotic condition simply stated, they are “out of touch with reality.” Hallmark symptoms can include: delusions (a pattern of cognitions which are not congruent with the world); hallucinations (sensory input that, though seems real, is not – this can involve hearing voices which no one else can hear, seeing things that are not there; commands which only they can hear; even feeling that they are being touched and the sense of smell or taste…). So, to them all these symptoms are considered to be real! Why are so few being treated? Stigmatization of mental disorders. And, the very symptoms precluded the insight that something is very wrong. It must be remembered that when a psychotic person hears the hallucination: “Kill so and so,” it is as clear as you reading this line. It appears to be quite real. From before a half-century ago, such people were involuntarily committed to “state hospitals” – often far away from family and friends – isolated. There were almost no viable treatments and these hospitals were more like dungeons. What to do? President John F. Kennedy had a sister, Rosemarie, who suffered from some psychiatric condition – though it is not clear as to which diagnosis was appropriate. Her father, Joe, had her committed to a hospital and with little in the way of ameliorative efforts, she was given a lobotomy, which exacerbated her mental state. She remained there until her death about 10 years ago. So, JFK had a keen interest in the treatment of those so afflicted. He proposed the closing of the state hospitals (see the 1948 film “The Snake Pit” for a quite realistic view of the conditions that one found in these “bedlams”). But, in part due to his assassination, the community program never went into effect, so a far worse situation has evolved: Half of those who are deemed to be psychotic are sent to jails and prisons. However, there is at least one good development: the introduction of drugs, which helped many (they are called psychotropics and include anti-psychotics Thorazine, Haldol, Lithium, as well as antidepressants, like Prozac…). How about violence? Actually, people with a psychotic condition commit this kind of behavior at about the same rate as “normal.” Most simply don’t have it together enough to attack anyone. The reason people believe the canard of say, schizophrenia and violence is due to the media always “highlighting” the psychiatric disorder when an event occurs. One of the most prominent psychiatrists in the U. S. is Dr. E. Fuller Torrey. He has an especial interest in schizophrenia because his sister has suffered from this disorder since her teenage years. In his many books, articles and appearances he implores our nation to become cognizant of mental illness, lessen the stigma, and stop putting these people in prisons and revamp the system so persons so afflicted can get the available help in suitable venues and conditions. David Chowes worked as a clinical psychologist at Creedmoor Psychiatric Center and taught at Baruch College/CUNY for 25 years. Community residents are invited to a free kayaking event at Stuyvesant Cove Park on Saturday, August 17 from 10:30 a.m. to 2:30 p.m. Participants must know how to swim, be at least 18 years old or attend with a parent or guardian, and must sign insurance waivers. All equipment is provided free. Participation will be on a first-come, first-paddling basis. Provided by Long Island City Community Boathouse. The event is a joint project of LICCB, the New York City Water Trail Association, and Urban Swim, in conjunction with the Lower East Side Ecology Center and the Gowanus Dredgers Canoe Club with the support of Solar 1 and NYCEDC. In addition, from 10 a.m.-2 p.m., Solar One’s long-running series of monthly “Family Day” events for children and their parents kicks off with an Interactive Plant Fair for Wildflower Week. For Family Day: Creatures, kids can make flower costume, collages and paintings, make seed bombs and plant wildflowers they can take home, get their faces painted and much more. RSVP to dina@solar1.org. The Waterside Plaza Dance Festival will take place on August 17 starting 5 p.m., featuring talented local dance companies and choreographers performing outside on the Plaza. This year performance groups are creating original site-specific work that showcases the unique landscape of Waterside Plaza’s outdoor space. Rain date is August 18. For more information, call (212) 340-4208 or email yketzis@watersideplaza.com. Waterside Plaza presents RCN Monday Night Movies on August 19 and 26. Films will start at dusk (usually around 8:15 p.m.) outside on the Plaza. Co-sponsored by RCN, admission is free and open to the public. For more information, call (212) 340-4208 or email: yketzis@watersideplaza.com. On Wednesday, August 21 from 6-7 p.m., Solar One will host Stuyvesant Strolls, a guided, sunset tour through Stuyvesant Cove Park. This is a great opportunity to discover the wide variety of plants and wildlife native to New York City. The next scheduled event for young residents of Stuyvesant Town/Peter Cooper Village and their guests is Kids Summerfest II, which will feature The Airborne Comedians, mini golf, and more on Sunday, August 25 at 3 p.m. on the Oval. See listings for more local events, including theater, concerts, comedy, kids’ events and more on the Town & Village Blog Around & About page. A kayaking event held at Stuyvesant Cove Park last Saturday was a hit with neighborhood residents. Who needs the beach when you have the East River? 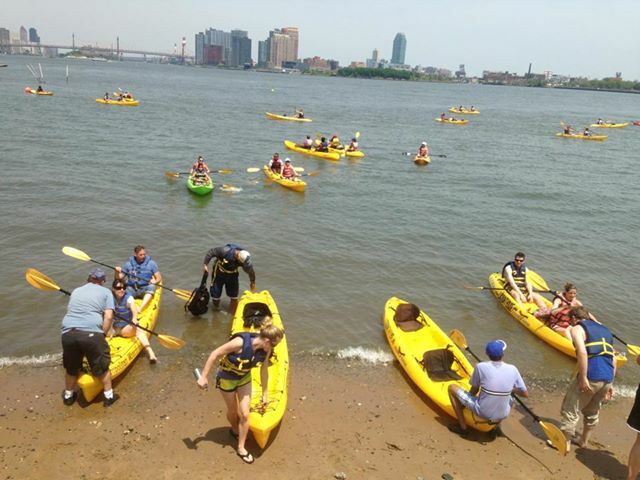 Last Saturday, neighborhood residents headed out to Stuyvesant Cove Park for a free kayaking event on the river, the second such event to take place since planning of the East River Blueway project got underway. Though this recreational event was unaffiliated with that plan, Deanne Draeger of the East 13th Street based organization Urban Swim said the goal is essentially the same, which is to get New Yorkers out onto a clean, safe waterway. 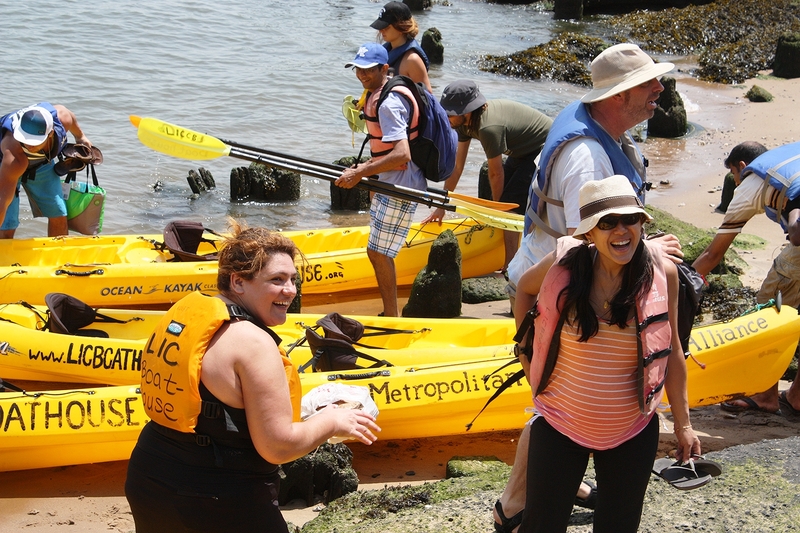 The first kayaking event at Stuyvesant Cove took place last August, and like this one, was a hit, with neighborhood residents of all ages, many of whom had never gone boating before, lining up to use the kayaks. According to Solar One’s figures, there were around 200 participants. Along with Urban Swim, the afternoon activity was also made possible by the Metropolitan Waterfront Alliance, NYCEDC and Long Island City Community Boat Club. The organization has also fostered relationships with other organizations that have supported its efforts including Solar One, the Lower East Side Ecology Center and the NY Water Trail Association. In addition to hosting events aimed at getting people into the water, including the occasional swim between Stuyvesant Cove and Coney Island, Urban Swim also does weekly testing of the water to determine its cleanliness. Fortunately, according to Draeger, most of the time, the water’s fine, at least for swimming and other activities. Draeger said Urban Swim tests at around 30 sites in Manhattan and then publishes its results. Urban Swim has been around since 2010, having gotten started after Draeger organized a swim for herself from Stuyvesant Cove Park to Steeple Chase in Coney Island, Brooklyn. When she did it again the following year and then the next, she invited others to join her and has since been organizing other events on the water. If anyone thinks they can handle a similar swim, the next opportunity will be on August 10, when the group once again heads from Stuy Cove to Coney Island. Another swim, from the Statue of Liberty to One World Trade Center, is scheduled for September 14. There will also be another kayaking day at the Cove set for August 17. For more information about upcoming events, visit the “Urban Swim” Facebook page. Unfortunately the Solar1.org website has been thoroughly hacked, and it’s going to take a little while to fix. I will be working on it overnight to the best of my ability, and I’ll try and get everything up and running as soon as I can. In the meantime, please DON’T visit solar1.org, cleanecnyc.org or gdl.solar1.org. However you can still register for March 22nd’s Clean Energy Connections panel discussion Power in Numbers: Capitalizing on the Data of Cleantech safely and securely by clicking HERE.